I have a culinary success to report. A couple of years ago I got caught up in all the hype around making your own bread – they made it look so easy on the Bake Off – and decided that the next step on my path to becoming a fully rounded cook, was to learn to make bread. Also my beloved Lorraine Pascale cook books had a whole selection of breads in them and well, she’d never led me wrong before so I felt confident that this was a thing I could master. I started myself off simply enough with rolls (which were decent) and English muffins (which were delicious) so I felt ready to tackle an actual loaf. I love Italian food so I thought focaccia would be the best place to start….this was NOT the case. My mum, who watches far more cookery programmes than I do, assures me that actually it’s a bit of a finicky bread and the art is in the proving so is not really the best place to start with bread making, but all I know is that I’ve tried to make it several times to different recipes (including one of those little packet mixes that are supposed to make it easy) with results that varied from ‘a bit rubbish’ to inedible. 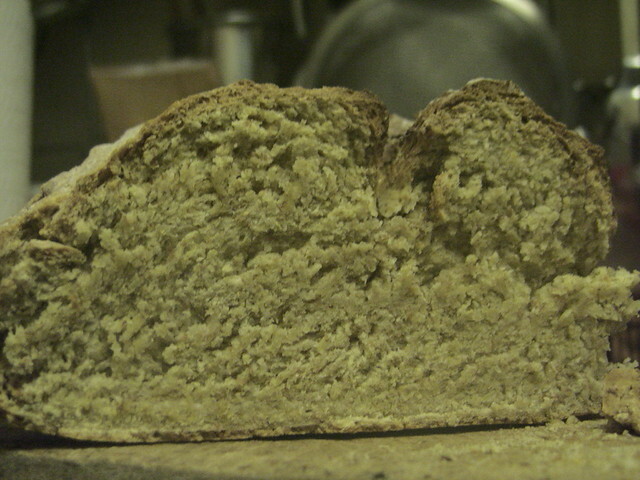 I was, I must confess, a bit scunnered with bread making. 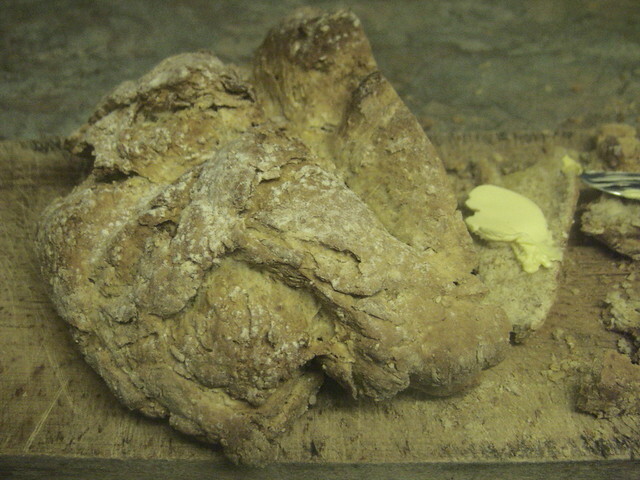 However, when I put together my original 30 recipes list, I put soda bread down on it as here was a bread that required no proving, and after my most recent jaunt over to Belfast in October I was reminded how much I like soda bread and wanted to learn to make it myself. I spent all of November procrastinating over the subject, gathering what I needed to make it and generally making excuses to not get round to it. This weekend I determined I was going to make it, for two reasons, one I hate admitting defeat and two if I didn’t make it soon the buttermilk was going to go off and I hate wasting food. So today I made soda bread. I stuck with Lorraine – because she’s right 90% of the time – and just adjusted for taste (no treacle as I hate the taste of treacle). It was quite an unusual process because it’s quite a sticky dough (the temptation to add more flour is great!) and you don’t knead it for very long, nor do you leave it to rise at all. The only effect the lack of treacle seemed to have was that I couldn’t get the nice smooth finish to the dough when I shaped it. Otherwise it all went well, it cooked away in the oven and once done it had a promisingly hollow sound. It was approximately twice the size of the loaf you see in the picture, because the instructions said ‘serve warm from the oven’ so we cut a couple of slices to see how it was and ended up eating half the loaf warm with butter. I was also instructed that I’m to bring a loaf for the family festive celebrations, as it will go perfectly with the pea and mint soup I’m making. So I think we can call this one a resounding success! Victory over (soda) bread is mine!